Why Forgiveness Fail Big Time? It has been more than a year I have choose silence over words to blog. In that period, I dived into left-brain world of business, bringing my spirituality quest to experience the real bites of left-brain business. In nearly 20 months, I allowed myself (unconsciously and consciously) to feel the pain; mentally, emotionally and physically. When we talked about spirituality, we have to put our ego on the table. Everything that I experienced, the likes and dislikes, the happiness and unhappiness; and all its interpretations, can be somewhat related to the ego-self. And that’s the hardest part because facing our ego-self means, all the blames on others must be witnessed instead of judged, accepted instead of condemned and complained. I must say, failure is inevitable, but success is rewarding especially to our self-evolution. After I have experienced what left-brain business can do and cannot do, I seek my way back to the journey I desire long time ago. The only different is, this time I know why I’m here and what I need to do for others. However deeply and excited I am about expanding the business and life entirely, I’m aware that, the stone I’m about to cast into a calm water must come from the state of Love. Intention is very powerful. The effects will reflect the intentions all the way to the end (if the end exist). Based on this fact, I decided to start a detachment process in details. The very first things I should do is experience forgiveness. I planned the entire February for this process because I’m leaving the company I worked for 20 months in February. My goal was; all the pain I felt for the past 20 months and the old pains including fears, hatreds, jealousy, resentments, must be transcended as much as I can. I just want to leave the place feeling peace about everything. 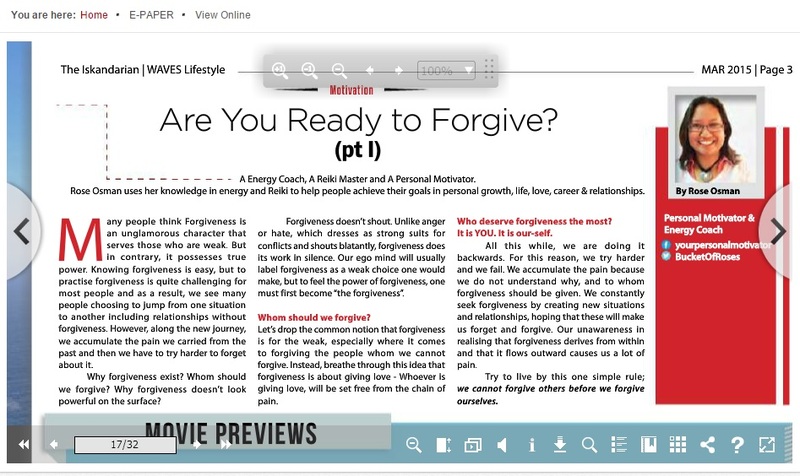 Therefore, I intentionally wrote about Forgiveness in the Iskandarian e-paper for March and April 2015 publication. Forgiveness is about facing our own ego. What truly hurt is the ego. Our body (the emotion and the physical body) release the pain based on what the mind says (the ego-self). Along this process, we forget the deeper side of who we are, the Soul, is in fact part of the process too. Where’s the Soul stand in this process? The energy of forgiveness never comes from our lips and tongue. If we say “I forgive you”, chances we just being nice and pretending are high. The source of forgiveness come from Love, and the place that contains this Love is our Soul. And we constantly forget our Souls, and remain in the state of ego, the place that use pain to live. That could explain why we keep feeling hurts even after we say “I forgive you”. I truly adore people who refrain themselves from giving others forgiveness because they mean honesty. But that bring us into another state of pain; resistance from allowing forgiveness to flow. Either way, pain is the result. What I’m sharing with you is about giving back the power to the soul (the real YOU) and let Our True Self, do the forgiveness from the within. The energy of forgiving will emanate healing through us, flow to our mind and body. The forgiveness will not just forgive but heal all sort of pains, mentally, emotionally and physically. And it free us from unnecessary accumulation of pain. This is ‘I forgive You’ that means business. Let’s stop giving the false power of forgiveness to the ego-mind because it can only forgive with sense of ego and that cannot even free us from the pain, even if it tries. Thank you and I Am Grateful to be back! Read the Iskandarian e-paper here. Is Grief Around the Corner?